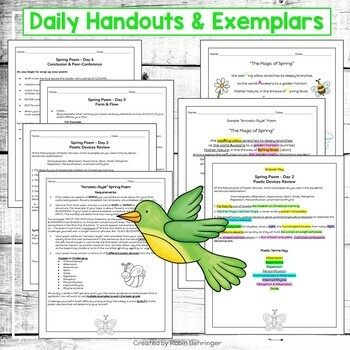 You'll be amazed at the poems your middle school students will create with this easy-to-implement 4 day lesson plan. 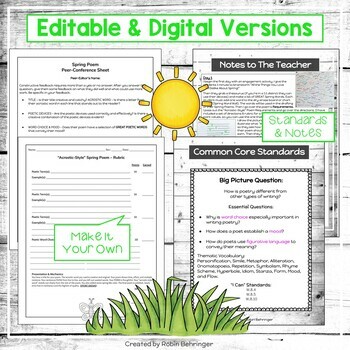 With a focus on Poetic Devices, these lessons encompass everything from Day 1 Brainstorm to Day 4 Rubric. 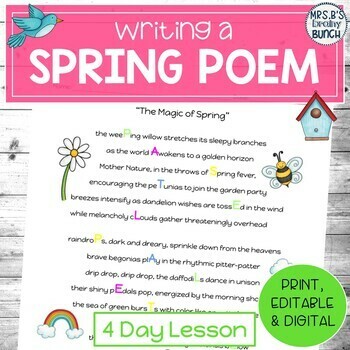 The form is "Acrostic-Style" meaning the students will select a spring word or words to form their poem, as seen on the cover of this product. The acrostic word in the example is PASTEL PALETTE as Mother Nature paints her garden into bloom. Some of the best poems I've read are about things students do not like about spring like the cold, rainy days and spring allergies. 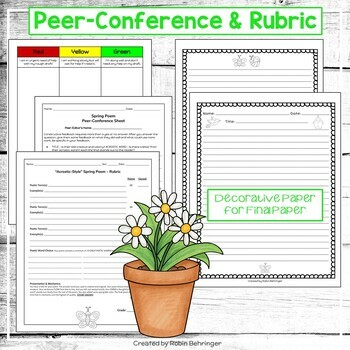 Their finished poems will be filled with original examples of: Onomatopoeia, Alliteration, Assonance, Idiom, Simile, Metaphor, Repetition, Personification, and Internal Rhyme.